When fishing off the coast of Trøndelag and Trondheim Fjord, you can expect to catch many different species of fish. Here you get an overview of the most common species. The halibut is the largest of the flatfish, and large halibut are commonly found at depths of 300-2,000 metres. Halibut fishing is illegal during the spawning season from 20 December to 31 March. The cod is one of the most common and commercially important of the saltwater fish. It is found at depths down to 600 metres. The coalfish has a strong and muscular body and is an excellent swimmer. It is found at depths of 0 – 300 metres. This species is characterised by its big head and enormous mouth. The head accounts for almost half the body length, which can reach two metres. It is found in shallow waters and as deep down as 600 metres. The haddock is easily recognisable by the large black blotch under the pectoral fin. It is a bottom feeder which is commonly found at depths of 40 – 300 metres. Tusk is distinguished by its long dorsal fin. It normally weighs around 3 kilos but can reach a weight of 20 kilos. Found in deep fjords and prefers depths of 200-500 metres. Tusk is considered a good food fish. 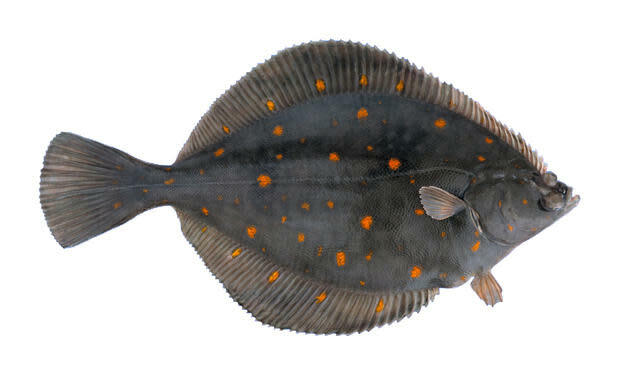 Turbot is a flatfish found along sandy shores, where it stays almost stationary near the bottom. It is an excellent food fish (firm, white flesh) and fetches a high price. 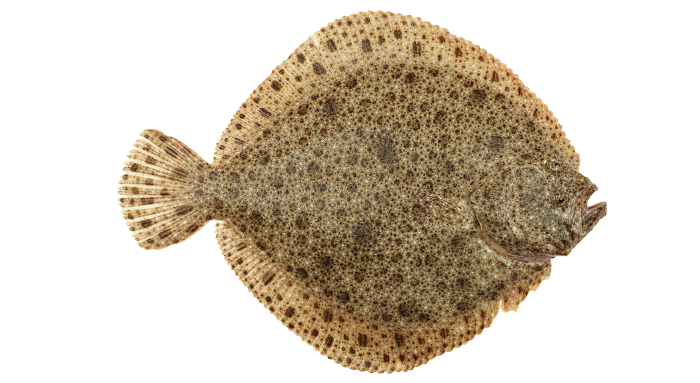 Turbot can weigh up to 25 kilos. The salmon spawns in fresh water but lives most of its life in the sea. When the young are 2-5 years old they leave their natal river and migrate to the ocean where they swim great distances in search of food. In Norway sea trout are found in large numbers all along the coastline. The sea trout can grow as big as 14 kilos, though this is rare. Just like the salmon, the sea trout runs up rivers and lakes to spawn. The catfish (wolffish) is distinguished by the dorsal fin that extends all the way along its back. It can grow as big as 125 cm and 20 kilos and can be found as far down as 450 metres. The redfish is found all along the continental shelf at depths of 100-500 metres, though it has also been caught at 900 metres. It can measure up to 100 cm and weigh up to 15 kilos. The herring can grow to 40 cm. It has a compressed body with large silvery scales and a large forked tail fin. In Norway, an adult herring (2.5–4.5 years) is known as ”feitsild” (fat herring). Pollack is easily distinguishable from coalfish by the dark line that arches sharply behind the first dorsal fin. Pollack weighs up to 10 kilos and is a common fish along the Trøndelag coast. Northern bluefin tuna is a rare species that is sometimes found along the coast of Norway in the summer season. Commercial tuna fishing stopped in Norway in the 1990s. Its long, slim body makes the ling easy to recognise. It is normally found at depths of 300-400 metres. It can grow up to a metre long. A good food fish similar to cod. A well camouflaged fish which prefers a sandy seabed, where it buries itself in the sand. Considered a good food fish, but there is no commercial fishing of this species in Norway. Found from the shoreline down to depths of 250 metres.